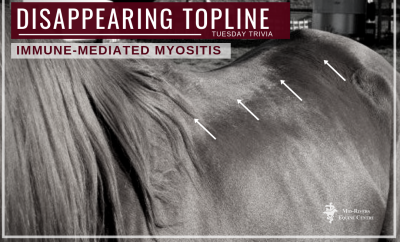 Immune Mediated Myositis (IMM) can cause a horse to loose 40% of its topline muscle mass in 72 hours. What Is Immune Mediated Myositis? IMM is a genetic disorder in Quarter Horse related breeds: Quarter Horses, Paint, and Pintos. It is an autoimmune disorder. When triggered, the body’s immune system attacks mutated proteins in skeletal muscles, resulting in a rapid loss of muscle mass along the topline. The disease has been recognized for nearly 20 years, but not until 2017 was it recognized as a genetic disorder, myosin heavy chain 1 myopathy (MYHN). It is estimated that 7% of all Quarter Horses carry the mutated gene. Reining, cow, and halter horses are thought to be the largest group of carriers with 16%-22% affected. The disease lays dormant until the immune system is compromised. Streptococcus infections are seen as the leading trigger of IMM episodes, but certainly not the only trigger. Veterinarians are able to treat the clinical symptoms and manage episodes. Complete recovery, however, will take several months as the process of regaining muscle mass is a slow one.